On Sunday Israeli Border Police arrested two CPT members while they were walking Palestinian children from kindergarten just after noon. The CPTers were taken to the police station near the Ibrahimi Mosque, then moved to a police station in the Givat Havot settlement, and finally released at 5:20 p.m. Israeli police did not press formal charges. For several weeks, members of CPT Palestine have accompanied children from the Al Saraya Kindergarten, who face harassment from Israeli Border Police, Israeli soldiers, and settlers during their walk to and from school every day. Part of their walk to school is on a road that the Israeli military has declared partially off-limits to Palestinians, including young children. Since CPT began accompanying the kindergarten students, border police have stopped the children several times and told them that they may not walk on the street for security reasons, but have allowed them to pass on other occasions. This afternoon, border police at the checkpoint south of the police station stopped two CPTers as they were walking up the closed road – but allowed them to pass. The Border Police checked their IDs, and then let them continue up to the kindergarten. When the CPTers returned with some of the kindergarten students, the border police stopped them again and asked for their IDs. At that point, CPTers handed over their IDs and once the IDs were returned, the CPTers proceded down the Palestinian path. The border police at the top of the hill radioed down to the two officers at the bottom of the road and ordered them to detain the CPTers. After two hours of detention at the checkpoint, the border police took the CPTers to the nearby police station. Just after 5pm, the police released the two CPTers. On their way home, they were prevented from walking through the checkpoint beside the Ibrahimi Mosque, and had to take a taxi back to the office. Other CPTers and internationals returning from the police station were prevented from walking down any part of the road near the kindergarten. Additionally, many more soldiers were walking the streets of the Old City. “It’s hard to understand why we were arrested. We were not confrontational when the Israeli border police had asked us to take the small school children down the long, garbage-filled path that had been carved out for Palestinian traffic by the Israeli government. We simply asked why the kindergarteners could not enjoy the same rights as walking down the path set aside for the Jewish minority – a right that the commanding officer had granted us previously,” said the CPTer. 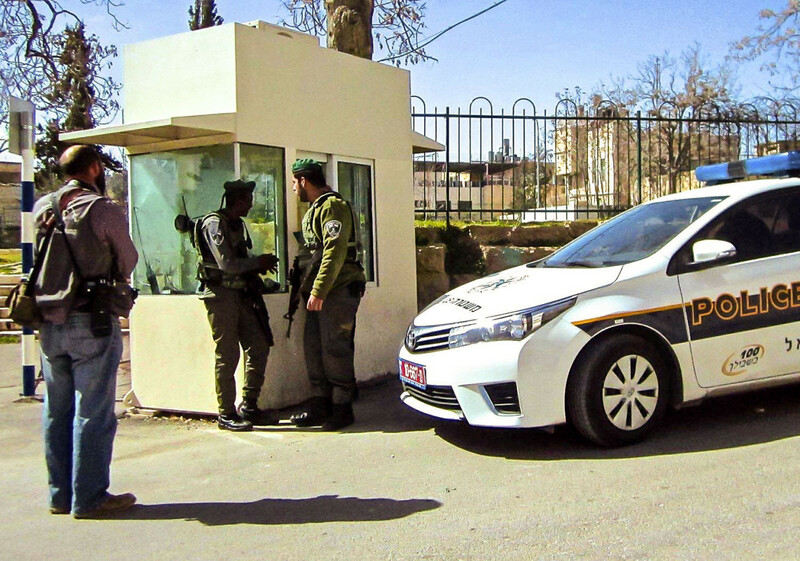 The arrests become more clear in the context of the last month: The Israeli Golani Brigade and the Border Police have specifically targeted human rights organizations and Palestinians across Hebron. In the past month, the IDF has broke into two human rights organizations office. Last Friday an international and four other Palestinians were shot with live ammunition during a Friday protest. There has been higher right of ID checks at check points, and this week there was a sharp increase in Israeli border police stopping Palestinians in the Old City, A few days ago, Barak Marsel, a far-right candidate for the Knesset, targeted a Palestinian shop in front of the Ibrahimi Mosque. It is not clear if these recent provocations are a part of a larger ramping up of the occupation of the West Bank. Its not clear what will happen in the upcoming days, either for CPT or for the children of the Al Saraya Kindergarten. Please pray for everyone in the Old City of Hebron who is affected by this continual and increasing violence.